This was an incidental finding on a 53 year-old male with a 32-year tobacco use history who had discontinued regular smoking in 2014. The patient was working on a ladder, fell off and was admitted for a trauma assessment. 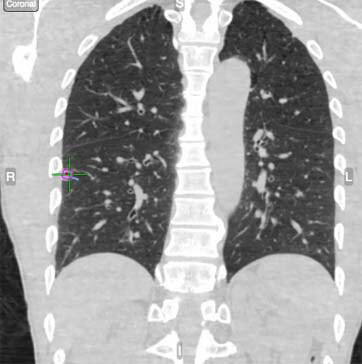 He did not have any broken bones or other serious trauma; yet on the trauma CT scan he was found to have a nodule. 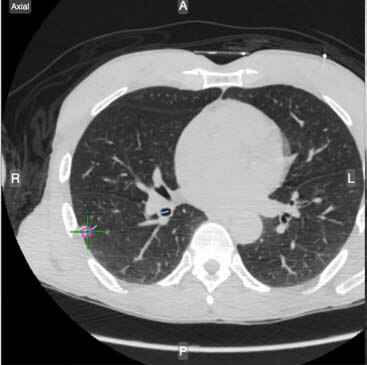 Upon review of prior imaging from 2014, the nodule had increased in size and his risk of malignancy had increased 4.2% per Brock University Cancer Predication Model. IR declined the biopsy because they felt it was too small and movement during respiration would make it hard to target and sample. The RLL nodule showed significant movement between inspiration and expiration. During planning, it was noted that the nodule movement was 36.6mm. The procedure began with the Always-On Tip Tracked® forceps used to verify accuracy with a main and secondary carina touch. 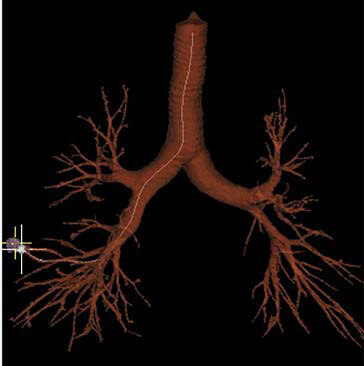 Due to the patient’s dynamic lung movement, it grew increasingly challenging to navigate to the correct airway. However, because of Veran’s respiratory gating, when the breathing was matched the instruments advanced to the appropriate airway. Upon navigating to the RLL, the target was localized. The movement of the nodule required close respiration monitoring to ensure the sampling was from diagnostic tissue. The Always-On Tip Tracked® forceps was used to take five samples, and the Always-On Tip Tracked® brush was used to take two samples. On-site Pathology revealed atypical cells with high N:C ratios, hyperchromatic nuclei and prominent nucleoli. TTF-1: Positive, Napsin: Positive, P40: Negative. This is consistent with Pulmonary Adenocarcinoma. 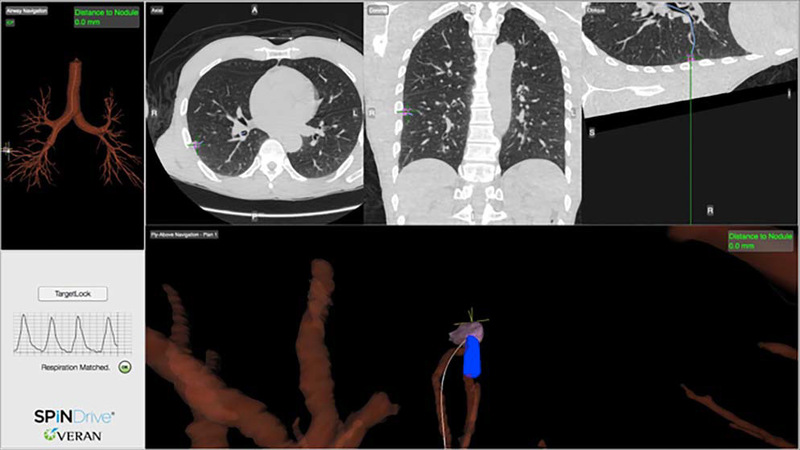 The patient went for a surgical resection of stage 1 lung cancer.